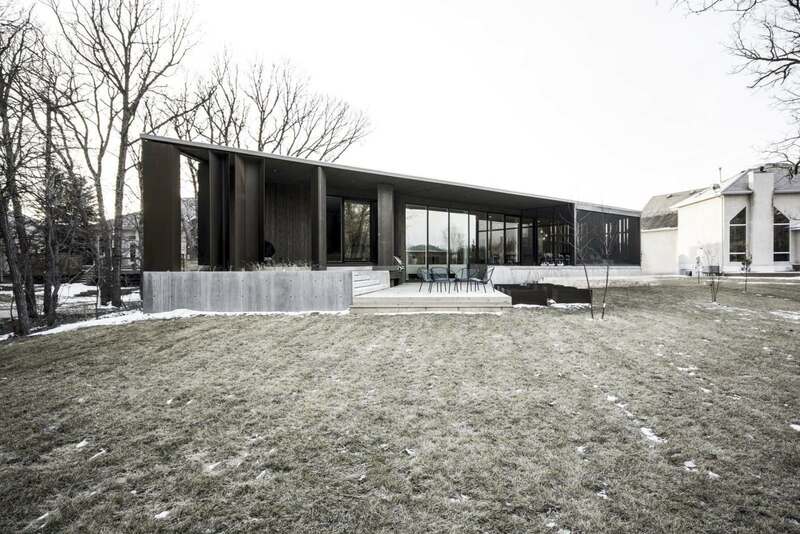 Designed by the Calgary office of 5468796 Architecture, the Parallelogram House is located in a suburban neighbourhood in Winnipeg, Manitoba, where it stands in contrast with the area's 30-years-old shingle and stucco-clad houses. Designed as a spacious bungalow for a family of five, the 2,700 square foot residence (plus lower level) took the shape of a parallelogram when the architects found the angled plan resulted in a larger footprint within the required setbacks. 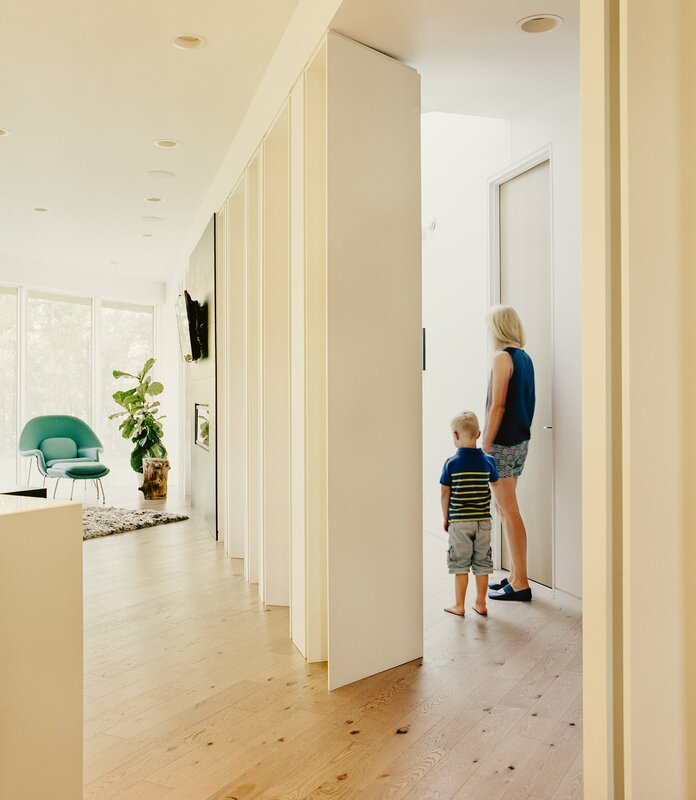 This accommodated both the clients' preference for single level living, while better utilizing the opportunities of the site, including orienting the dwelling's living space towards the deep backyard. On the exterior, the elemental materials of cedar and Cor-Ten steel ground the dwelling to the site. The angled roofline cleverly extends over tiered terraces and covered porches to create specific zones of outdoor living which are both protected while creating shade. Inside, the entertainment areas feels expansive with its 11-foot-high ceilings, neutral colour palette and generous glazing. A white metal screen demarcates the private zones of the residence, both complementing the rythym of the exterior metal columns while offering visual intrigue. It's always a treat to see great architecture which offers an innovative solution to the site, a clients' needs, and suburban convention. And it has not gone unnoticed. 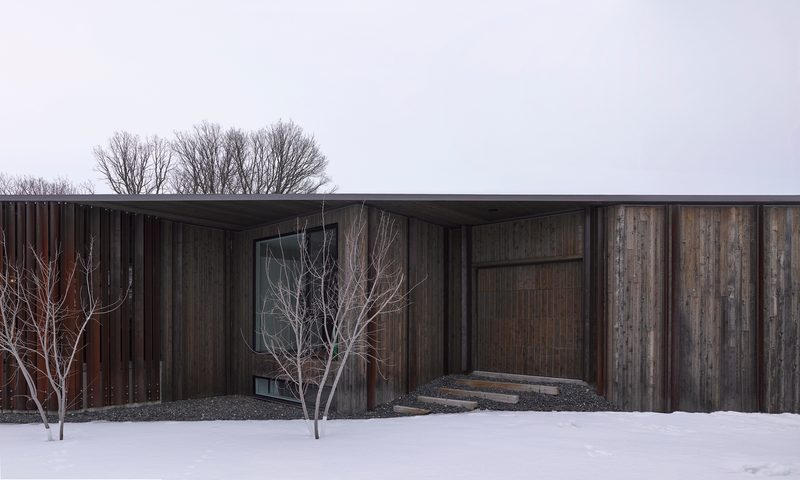 Parallelogram House won a Governor General's medal in architecture, granted by the Royal Architectural Institute of Canada (RAIC) and the Canada Council for the Arts. Researched and written by Steven Fudge, the purveyor of Houseporn.ca and proprietor of Urbaneer.com, a real estate sales and marketing division of Bosley Real Estate Ltd, Brokerage in Toronto.